A bridge between Italy and the East, Puglia is pure southern Italy: layers of history, vibrant cities and towns, ancient traditions celebrated in colourful festivals; a timeless interior edged by an endless coastline; gracious hospitality and fabulous food. Evidently, the God of the Jews didn't know Puglia, otherwise he wouldn't have given his people Palestine as the Promised Land. – Frederick II, Holy Roman Emperor and King of Puglia (1194 to 1250 AD). Frederick II was a little biased, but he did have a point with its castles, rolling hills, intirguing towns, spectacular coastline and Baroque extravagances, Puglia has lost of none of its fascination. Highlights include: wandering the medieval lanes and allies of Bari Vecchia (old Bari); Frederick's extraordinary castle of Castel del Monte; walking along country lanes lined with ancient dry-stone walls, olive groves and fields filled with wildflowers; exploring the myseries of Matera; sleeping in a restored 18th century 'trullo'; an evening with dinner in a 15th century 'masseria' (a fortified farm complex) surrounded by 2,000 year old olive trees; sailing on the Adriatic Sea; a cooking day in a 17th century palazzo in the heart of the 'Salento' district; coastal walks along both the Adriatic and Ionian Seas; the fabulous Pugliese cooking; and last, but not least, the warm southern hospitality. Visiting Puglia is an adventure. It is a delightfully different world to the fashionable streets of Florence, Milan and Venice: little English is spoken; time is flexible; it has been little touched by tourism and surprises lurk around every corner. A trip to Puglia is a fascinating and rewarding experience, particularly in the spring. Without mountains, Puglia offers relaxed walking through undulating hills, following country lanes lined with drystone walls. The first four walks are in central Puglia, passing through forest, wheat fields, cherry orchards and olive groves. The last two are coastal walks: the first heads south down the Adriatic coast with glimpses of the mountains of Albania to the east and Corfu in the south (weather permitting) while the final walk winds along the Ionian coast through Puglia's oldest national park. The main feature of all the walks in this season is the wildflowers. The walks range from 4 to 14 kilometres and take from 1 to 4 hours. In some cases it is possible to shorten the walks or opt out and join the walkers for lunch. The accommodation is 5-star hotels all the way, but Pugliese style, ie low-key and gracious. We stay in an historic hotel in the centre of the old town of Bari at the beginning; then a lovely hotel set in gardens surrounded by olive groves with a beautiful swimming pool, each guest having their own restored, 18th century ‘trullo’ (traditional conical stone house); then a welcoming boutique hotel with a roof terrace with views over the port in the heart of the most charming town in Puglia; and finally another historical hotel in the pedestrian centre of Lecce, the ‘Florence of the South’. In spring time the market gardens and kitchen gardens of Puglia are bursting with fresh produce (tomatoes, zucchini, egg-plants, artichokes, asparagus, fava beans) which provides the basis for all the region’s cooking. Pugliese cuisine is simple, rustic and cheerful, based on the abundance of its fertile plains and coast line. As Italy's wheat belt, pasta and a variety of excellent breads are pillars of Pugliese diet, as is olive oil (Puglia has over 50 million olive trees, some over 2000 years old). Puglia is bounded by two seas, the Adriatic and Ionian, and has an abundance of seafood, while the butchers of the Istria Valley are famous throughout Italy. One of the highlights of the tour is the cooking day towards the end of the tour, when the secrets of the local cuisine will be explored (see the initinerary for details). For a long time, Puglia was a workhorse, providing robust bulk wines to bolster the pallid wines of northern Italy. However, since the 1990s, a new generation of vignerons have reinvented the industry, launching traditional wines such as Primitivo (known as Zinfandel in the USA) onto the international market, as well as creating new wines from ancient grapes, many on the edge of extinction (such as susmaniello and minutollo). We will visit two wineries, one headed up by a young man in the Itria Valley and the second one of the most celebrated producers of Primitivo (where we'll have a light lunch after a degustation). The tour will be lead by Simon Tancred. "I first went to Italy as a backpacker in 1980 and fell in love with the country. I returned in 1983, living and working in Milan until 1988. Afterwards I worked at the Institute of Languages, University of New South Wales (Sydney) taking guided tours to Italy annually. I spent two years with my family in Prato (Florence) in 2003 and 2004, working at the Monash University (Melbourne) Centre. Since then I have dedicated myself full-time to Hidden Italy. I love photography and writing and have had articles and photographs on Italy published in most major Australian newspapers and travel magazines. I speak fluent Italian, alas with a pronounced Australian accent. "Great Walks" magazine recently said I had the best job in the world.. there are other much more worthy jobs around but I am lucky my passion has become my profession - click here to read their interview." Interested in the Puglia walking tour in the spring: Bari to Lecce Guided Tour? 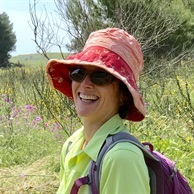 Find out a little more about the Puglia walking tour in the spring: Bari to Lecce tour by reading some of our most frequently asked questions. I think you've got the combination just right: well paced walks and memorable lunches - the food was superb. You do it all very well and I think your personalised tours must be unique. Thanks for a great holiday!